There might be an updated mapbook that covers this area in greater detail. most summiters might need to allow 10 hours roundtrip for the climb. requires a minimum 2-3 day trip, overall. Difficulty: Some Class 3, some snow, many route sections with exposure, do not attempt when wet. In this region, the name “Birkenhead” is probably most commonly associated with the lake and provincial park of that name rather than the peak. 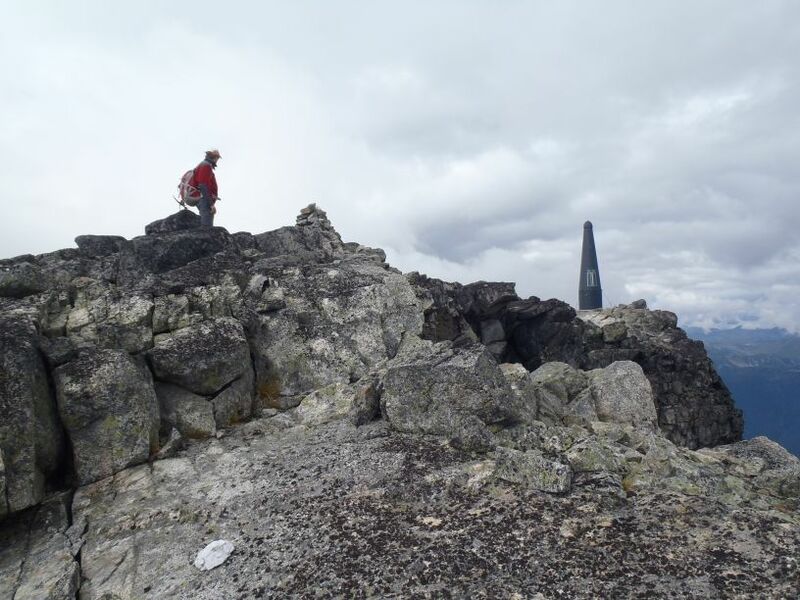 However, Birkenhead Peak is a quality mountain, both in regards to stature and destination. With a clean prominence of 5843 feet (1781 meters), the peak stands high above its immediate surroundings as if an island within a mountainous range. 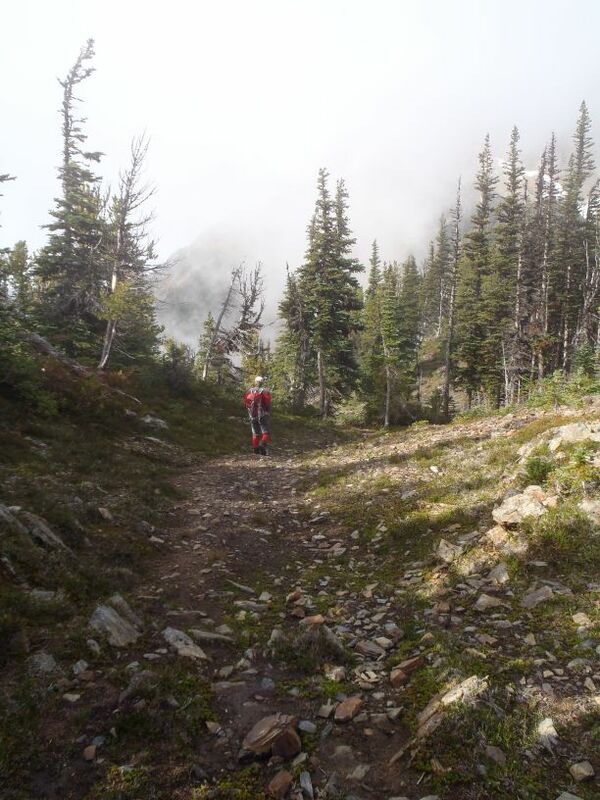 Some maps show a “Birkenhead Peak Trail” but the reality is that the “trail” is more like a narrow goat path in many sections; getting lost or slipping is not an option in many sections of the route, especially during the approach's first half. The mountain is seldom climbed, possibly only summited by an average of 1-2 climbing parties annually. John and I left our homes near Puget Sound on a Friday night, eventually finding a suitable camping location alongside the Sea-To-Sky Highway late that evening. We woke up early the next morning and drove to the small saddle near the last set of microwave towers. The final approach road to the “trailhead” climbs an astonishing 5250+ feet (1600+ meters) in only 6.6 miles (10.6 km); John’s high clearance 4WD was definitely helpful. 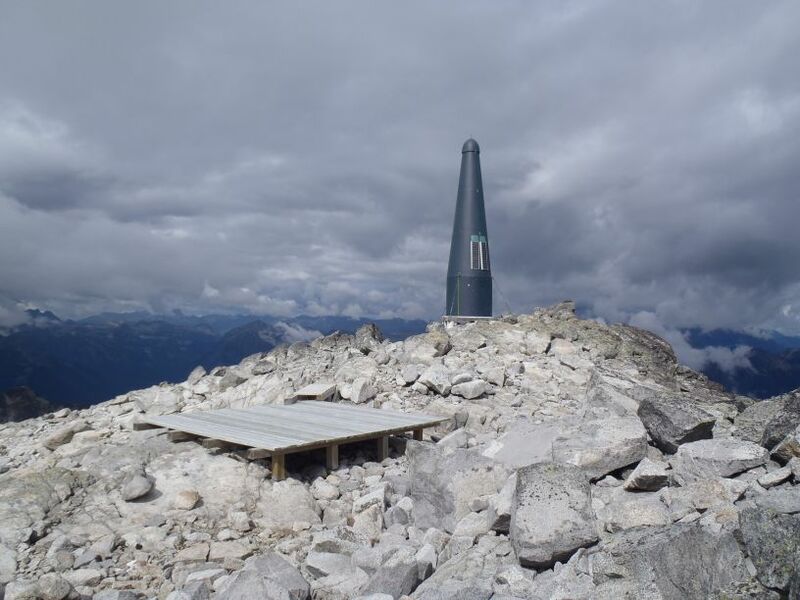 As is the case with many high elevation Canadian mountains, we found September a good month to visit Birkenhead Peak due to a late summer weather window, no bugs, and limited snow along the approach. 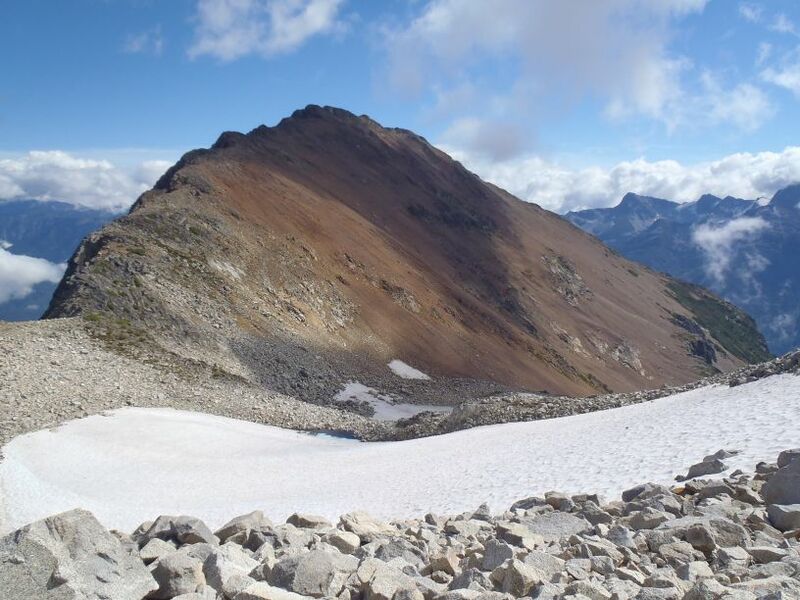 Most potential summiters attempt the peak during dry days in August, September or possibly early October if a late season weather window allows doing so. 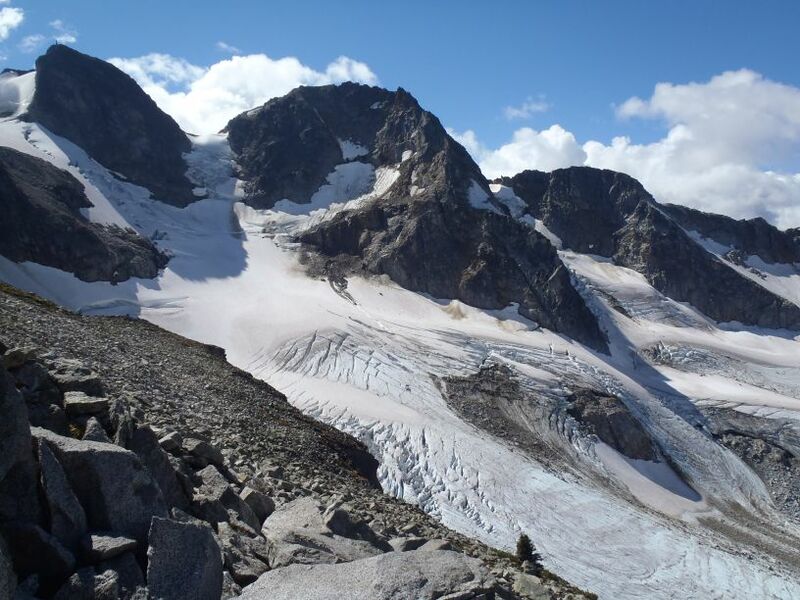 Some climbing parties attempt the peak earlier in the summer, and occasionally spring, but high elevation snow and ice can cause major route complications and possibly even make some route options inaccessible. The standard approach should only be attempted during dry periods due to steep sidehilling, steep traverses along loose rocks, plus traverses and scrambling along steep rocky sections covered by lichen and other plant growth which become dangerously slippery when wet. 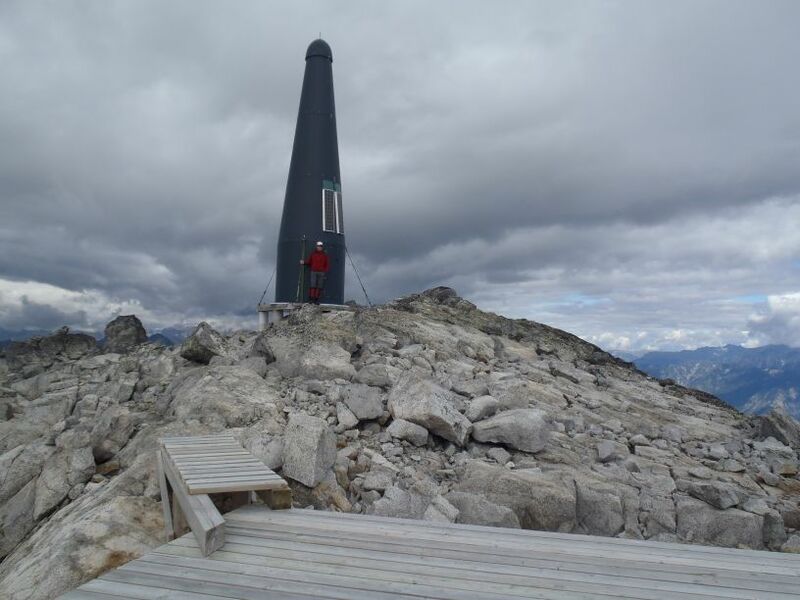 The summit is worth the effort, with vast views in every direction. The summit hill also has a tall tower enclosure and a wooden landing platform. 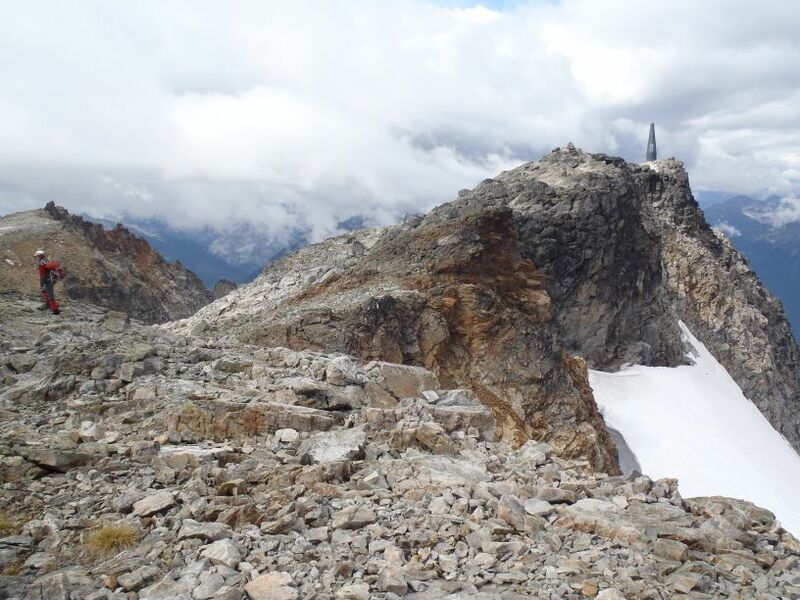 The tower can be seen from many areas of the upper route, and perhaps can be used by potential summiters as a beacon of hope/despair for how close/far the summit still is during an attempt. I created a detailed SummitPost page for this peak. Other trip reports and information for Birkenhead Peak might be found on the ClubTread forum website. 1) Drive east along Highway 99 ("Sea-To-Sky Highway"). towards D'Arcy and Birkenhead Lake Provincial Park. 3) After approximately 34 km (21 miles), turn left onto Blackwater Creek Road, towards Birkenhead Lake. 4) Within 1.0 km, a steep gravel road appears on the left side of the main road. King D'Arcy/Microwave Forest Service Road. Elevation is approximately 300 Meters (984'). IMPORTANT: This access road is a single lane dirt and gravel road, very steep in places. The road climbs 1600 meters (5250 feet) of elevation gain in only 10.5 km (6.6 miles)! 4WD or AWD vehicles should be driven on this access road. 5) After approximately 1.9 km (1.2 miles), the road splits. Veer right onto the road continuing uphill. 6) After approximately 0.6 km (0.4 miles) from the previous junction, the road splits again. This time, take the straight/left road which temporarily goes downhill. passing by microwave towers #1 and #2, reach a large road bend leading microwave tower #3.
steeply uphill (to the west) from the road bend; this old road is the trailhead. Elevation is approximately 1900 meters (6240 feet). I have divided the standard Birkenhead Peak route into five distinct sections. 1) Follow the old dirt and gravel jeep road until it soon reaches a dead-end at a flat rocky landing. goes in a westward direction as it rounds corners and ascends small hills. 3) The trail tends to disappear atop a small meadow hill which has a great view of the southeast side of Microwave Ridge's southeast side. view of Microwave Ridge from initial trail. 4) Descend the small hill until reaching a generally flat area at the base of a small boulder slope. 5) Hike through the small meadow/rocky area towards a large block of rocks located on the southwest (left) corner of the area. 6) From near the large block of rocks, look ahead (and above) at the slope in the distance. If you focus well enough (assuming good visibility), you should be able to locate an outline of a path along the slope. Mentally trace the general path direction back to where it appears it might reach your location. Walk towards that path as best as possible. especially upper-left of center heading towards and across a dirt slope. 7) Once the trail is found, it is a well-defined path which side-traverses sloped meadows and small forest groves. This marks the beginning of what I denote the "Goat Trail Traverse". 8) The path goes uphill until reaching the top of a forest/rock rib. Beyond this location is where the "Goat Trail Traverse" has gained a notorious reputation. Looking back at first part of route from the first forest/rock rib. Microwave Tower #3 can be seen in the upper-right of the photo, partially behind a large rocky hill. 9) The "Goat Trail Traverse" then crosses at least a half dozen steep dirt and scree gullies and slopes, many times with cliffs below. Sometimes apparent footings are smaller than boot sizes, and sometimes seemingly stable terrain is not. Some of these gully traverse sections are nothing more walks but it might be necessary to hold onto small rocks or trees for stability and access; it might even be necessary to dig out new handholds and footholds if no safer options are seemingly available. The key to these gullies is to watch each step and take time analyzing the terrain. Surefootedness is essential and many people have turned around during this section of the route, as a slip could definitely be fatal in many of these gully side-traverses. 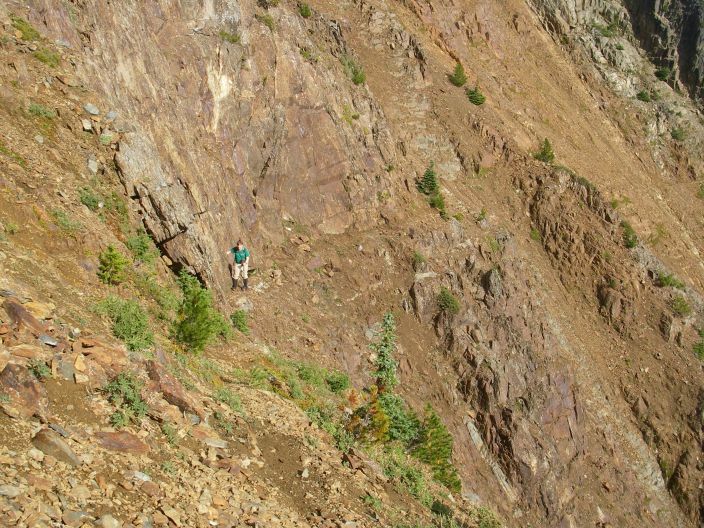 John crosses one of the steep dirt/scree gullies of the “Goat Trail Traverse”. 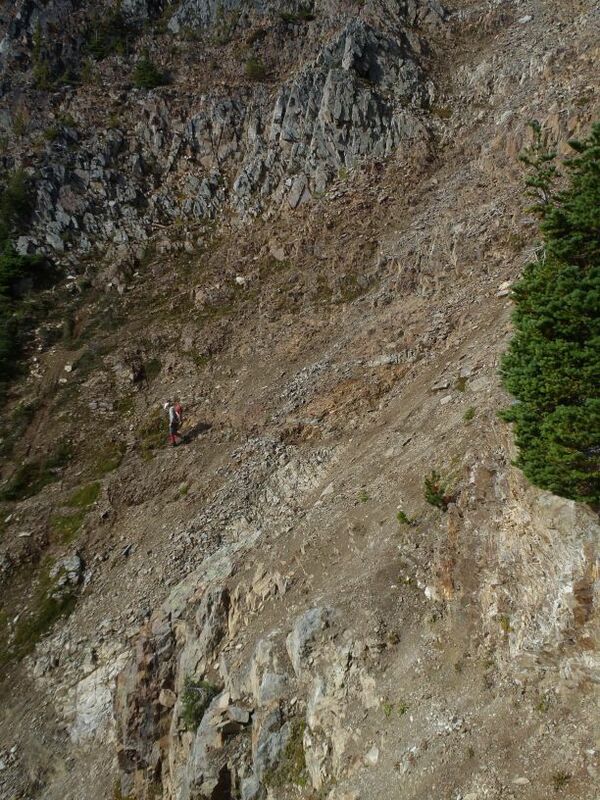 Craig crosses one of the steep dirt/scree slopes of the “Goat Trail Traverse”. Photo courtesy of John Stolk. 10) The "Goat Trail Traverse" ends at a small flat area below a very steep rock and tree slope. The path seems to continue around a corner of the ridge but soon fades out. 11) From the small flat area, look at the steep cliff immediately north. A steep dirt gully is seen angling up the right side. 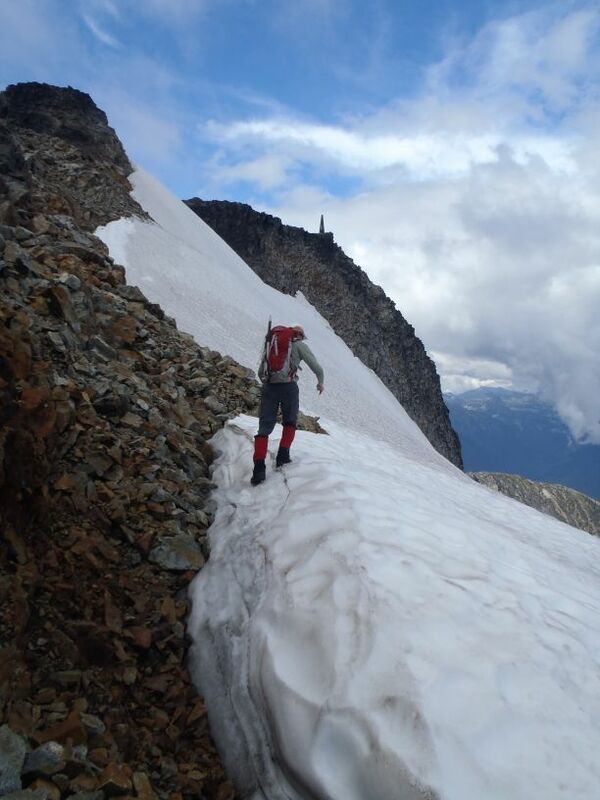 12) Steeply ascend the dirt gully. It is not as steep or exposed as it first appears from below. However, a slip in the gully could cause serious injury. The dirt is firmer on the sides than in the middle, and it certainly can assist a climber to use small tree branches and/or rocks for stability. However, many of the rocks in this area that seem stable might actually be loose or can easily break. Monitor your surroundings and use caution. SIDE-NOTE: It might be possible to steeply scramble up another part of the cliff other than the steep dirt gully mentioned in the previous description. However, the rock stability might be questionable and there are many tight evergreen trees obstructing access. John ascends the steep dirt gully. 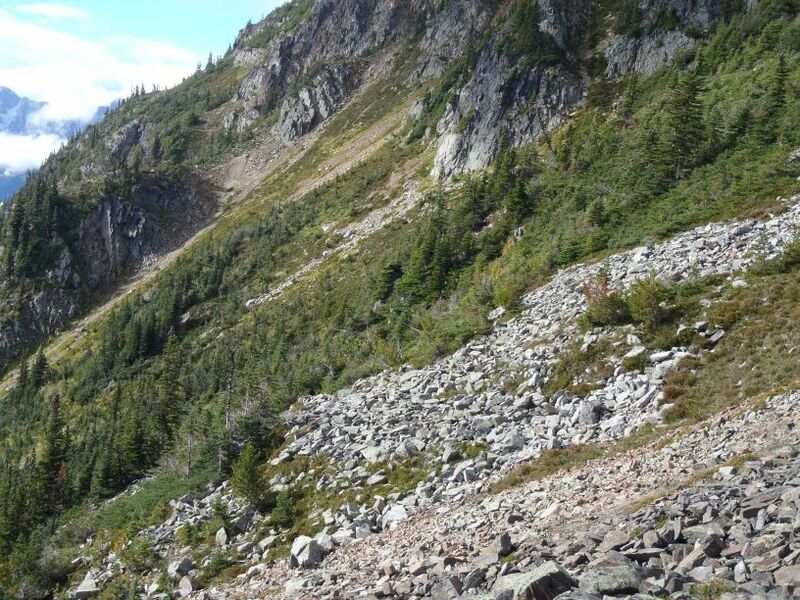 13) Once atop the steep dirt gully, continue ascending (possibly scrambling) scree slopes northward up the ridgeline. It is very important to make certain of where the top of the gully is, as many mountaineers have difficulty finding it during descents. Consider a marker or GPS waypoint. The summit of Birkenhead Peak can be seen from behind the distant ridgeline. First view of Birkenhead summit, peeking from behind its east ridge. 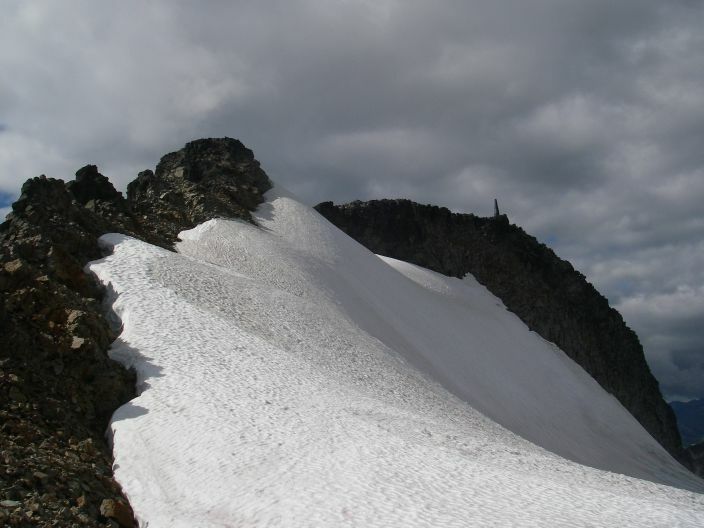 14) The steep ridge soon intersects another ridge, one which leads north towards the summit of Microwave Ridge. It is very important to make certain of where this ridge intersection is, as many mountaineers have difficulty finding it during descents. Consider a marker or GPS waypoint. John ascends north up Microwave Ridge. 15) Either ascend via sidehilling along loose scree on the upper west slopes of the peak, or follow more stable (but steeper) rocky ground along the top of the ridgeline. John ascends a steep rocky slope of Microwave Ridge. 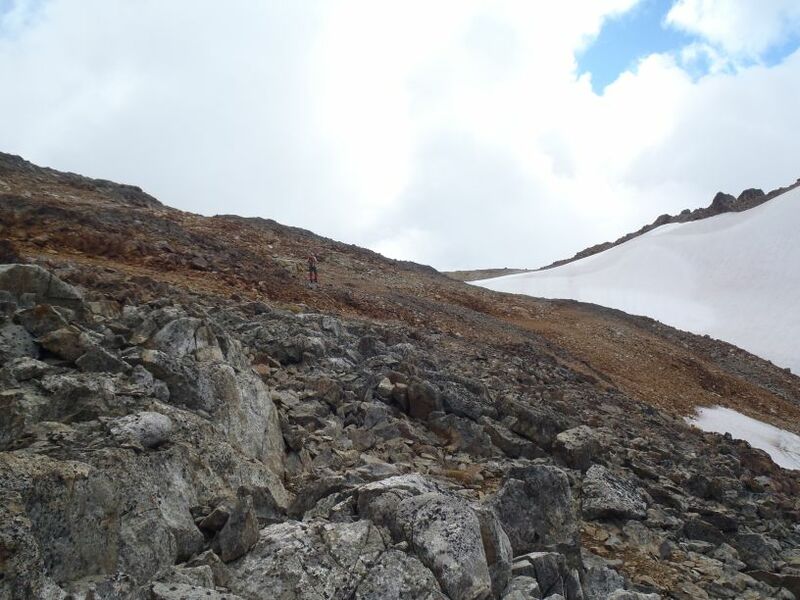 16) Either traverse over or pass by the summit contenders of Microwave Ridge (2314+ Meters / 7592'+), continuing north. Birkenhead Peak, as seen from atop Microwave Ridge. Craig hikes across Microwave Ridge. Photo courtesy of John Stolk. 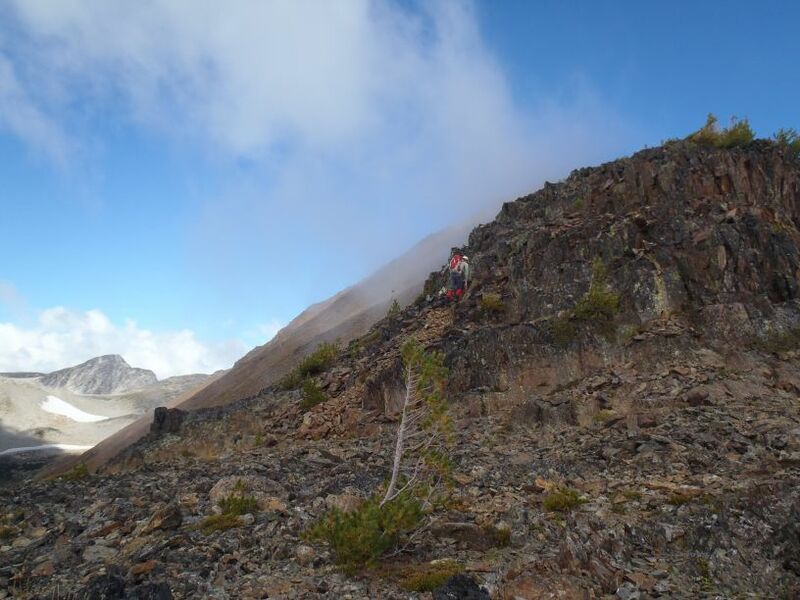 17) Drop down loose scree slopes on the northwest side of Microwave Ridge towards a small saddle (2120 meters / 6955 feet). 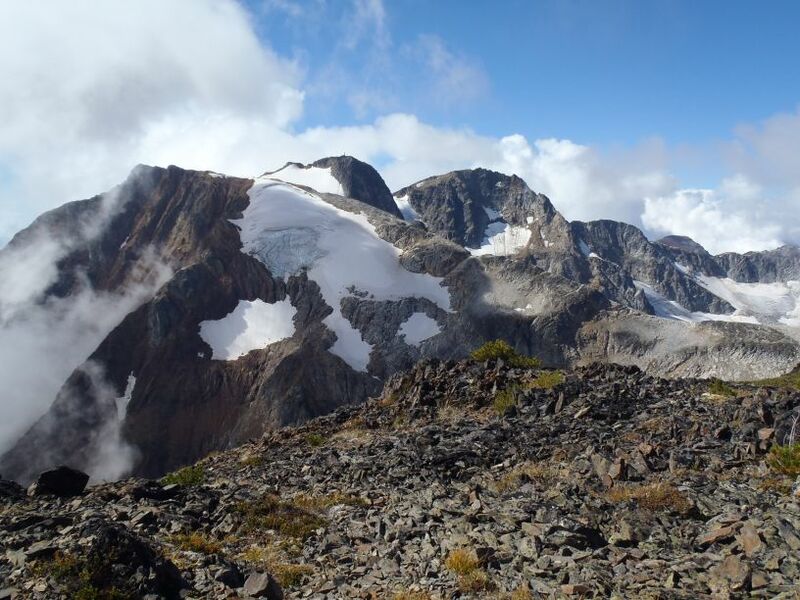 18) From the saddle, begin side-traversing rocky slopes and slightly uphill to small rocky saddle on the ridge extending north-northeast from Birkenhead Peak. The west side of Microwave Ridge, as seen from north of Birkenhead Peak. 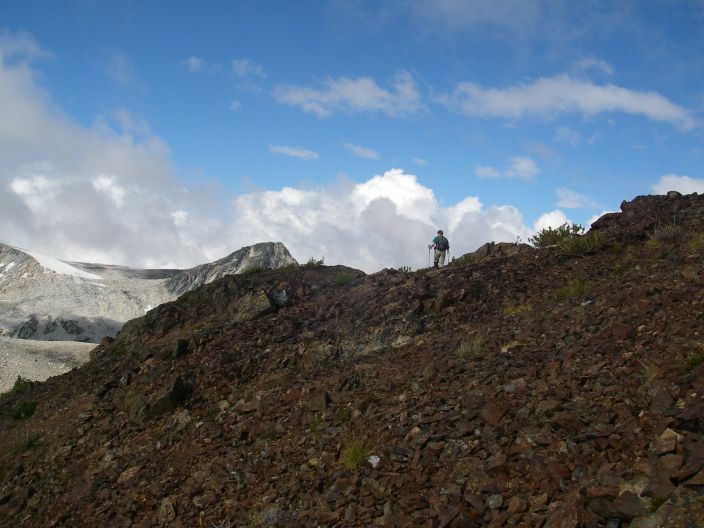 19) Hike south along the bouldery ridgetop, towards Birkenhead Peak. The bouldery north ridge of Birkenhead Peak. 20) As the ridgetop becomes steeper and more cliffy, begin side-traversing along the west slope (rocks, dirt, heather). begin to steeply ascend to the ridgetop. Some minor scrambling might be necessary. 22) Once on the ridgetop, continue following it until reaching a cliff face which appears to impede progress. 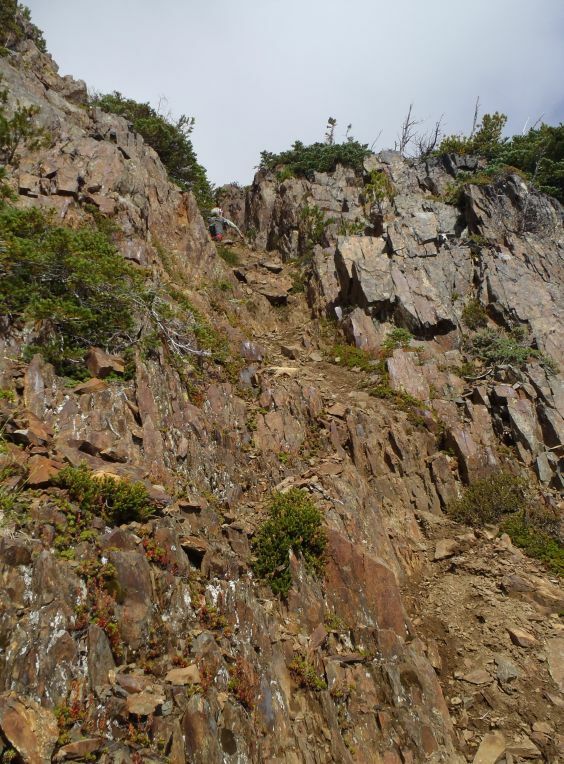 It might be possible to scramble or rock climb up the cliff face, but it is recommended to follow a narrow ledge around the west (right) side of the cliff face to a series of slanted ledges and large boulders. John tries to determine the best route up or around the cliff face. 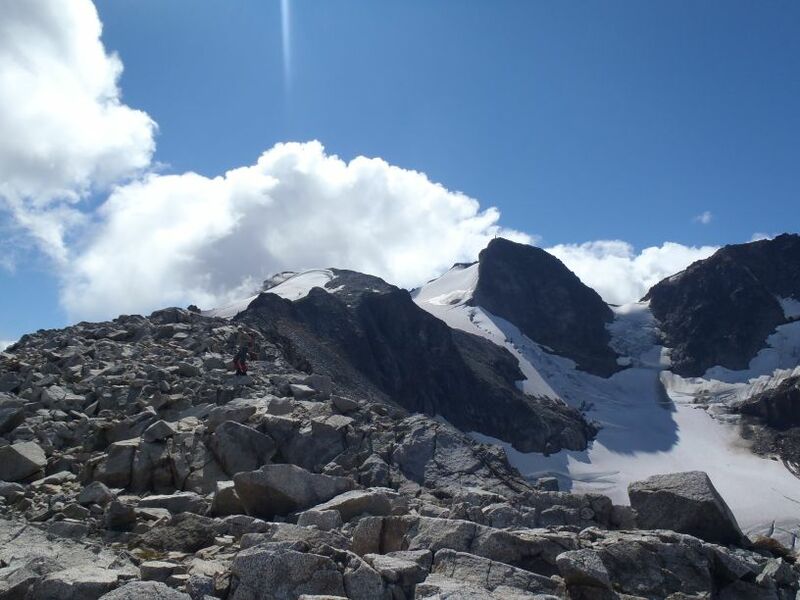 23) It might be possible to scramble far downhill and around a gendarme before ascending back to the ridgetop, but most mountaineers likely choose the quicker option to scramble directly up ledges and boulders to the ridgetop. However, this section can be dangerously slippery if wet, due to lichen and plant growth on the rocks and ledges, and there is definite exposure. 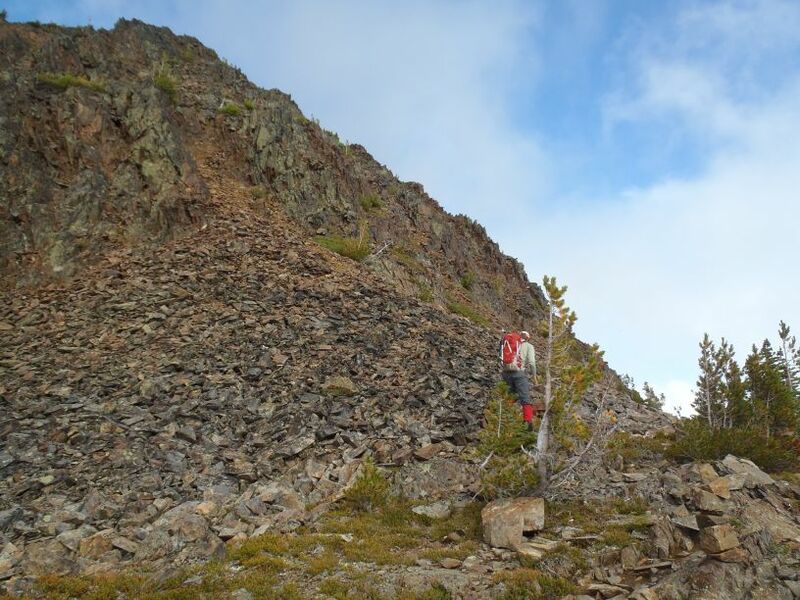 24) Continue following the ridgetop until reaching the base of a boulder slope. The summit is clearly in view to the south-southwest. Summit of Birkenhead Peak at upper left. Birken Glacier is at center. 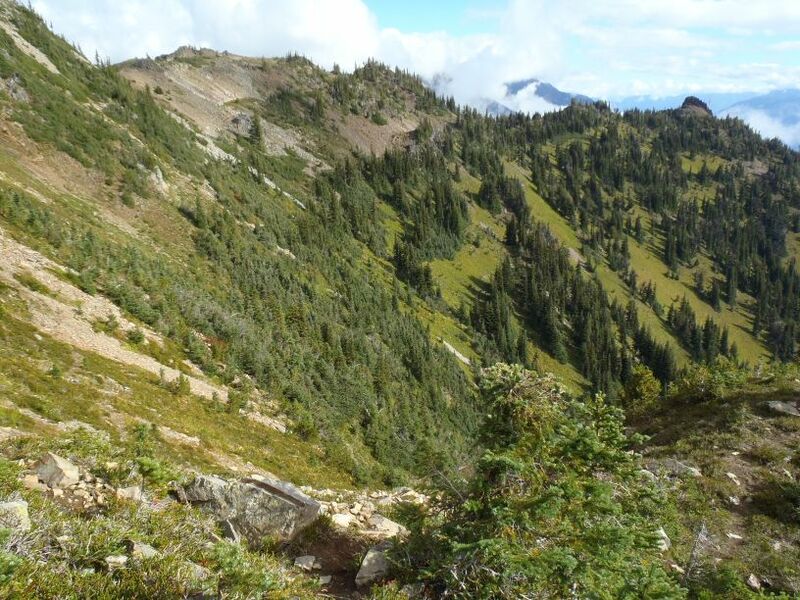 25) Hike and scramble up the slope, and then stay on or westside of the ridgetop until reaching a broad rocky plateau. Broad plateau at southern end of north ridge. west (right) towards the false summit of Birkenhead Peak. 27) Hike and then scramble (sometimes exposed) up or alongside several buttresses. The steep top slopes of the Birken Glacier butts against the north side of the buttresses. Many of the rocks on the buttresses and surrounding slopes are loose; some rocks and boulders look stable which might not be. Watch every handhold and foothold while scrambling. False summit on left, true summit in background on right. Photo courtesy of John Stolk. John begins ascending combination of snow and rock of false summit. 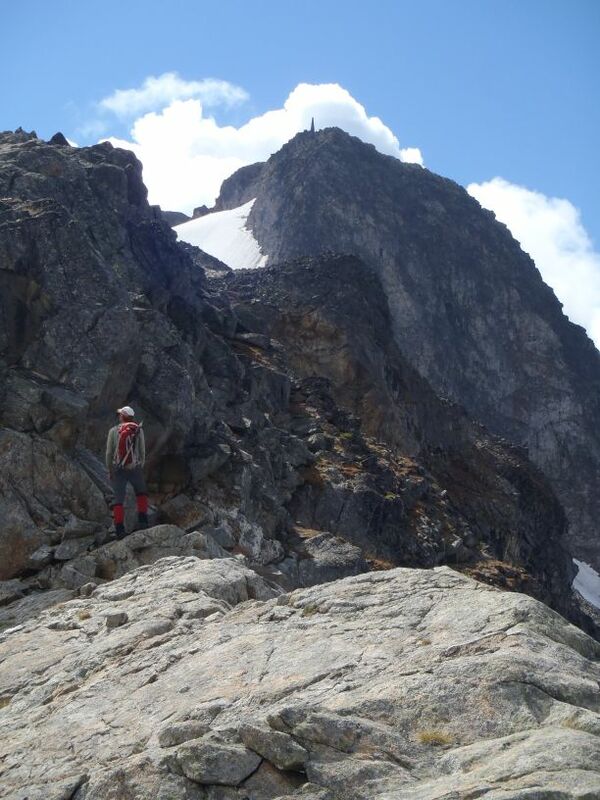 28) Once atop the false summit, drop down the right side onto some ledges. John looks for optimum location to drop down from false summit. 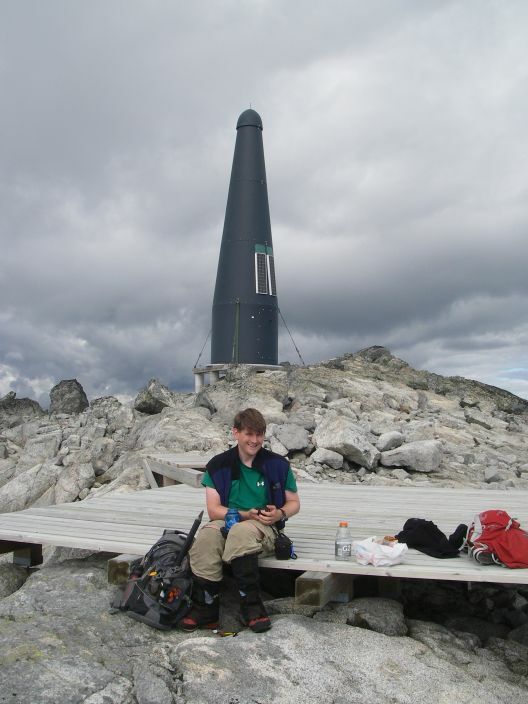 29) Cross a slanted slope alongside a cliff face to the final saddle before the true summit. is an artificial conical tower with a wooden helicopter landing platform nearby. John reaches Birkenhead summit. Tower can be seen in the background. Tower and helicopter landing platform. Craig takes a break on helicopter landing platform. Photo courtesy of John Stolk. John stands in front of tower. IMPORTANT: During late Summer and early Autumn, the general level of difficulty does not exceed YDS Class 3. However, there are multiple areas of the standard approach where a fall could result in serious injury or a fatality. 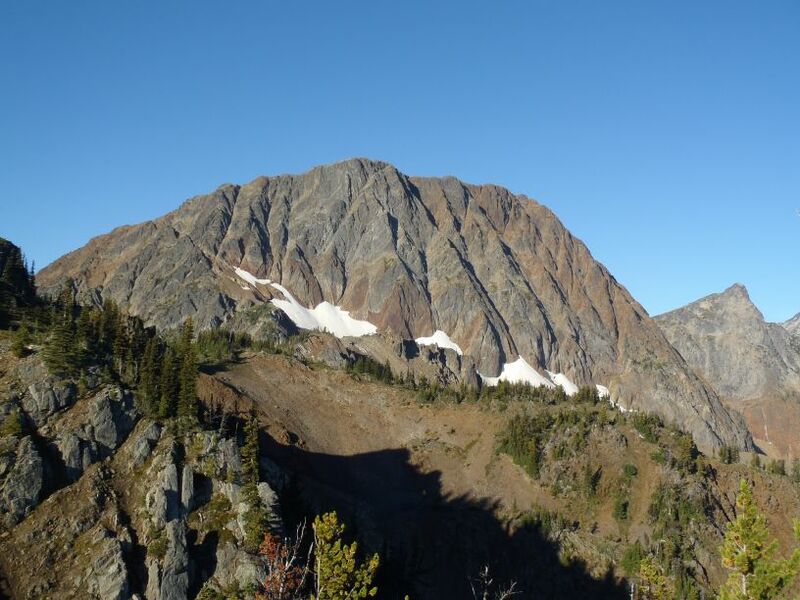 The most notable areas of caution are the "Goat Trail Traverse", the steep dirt gully, and several exposed locations along the north ridge and false summit ridge. 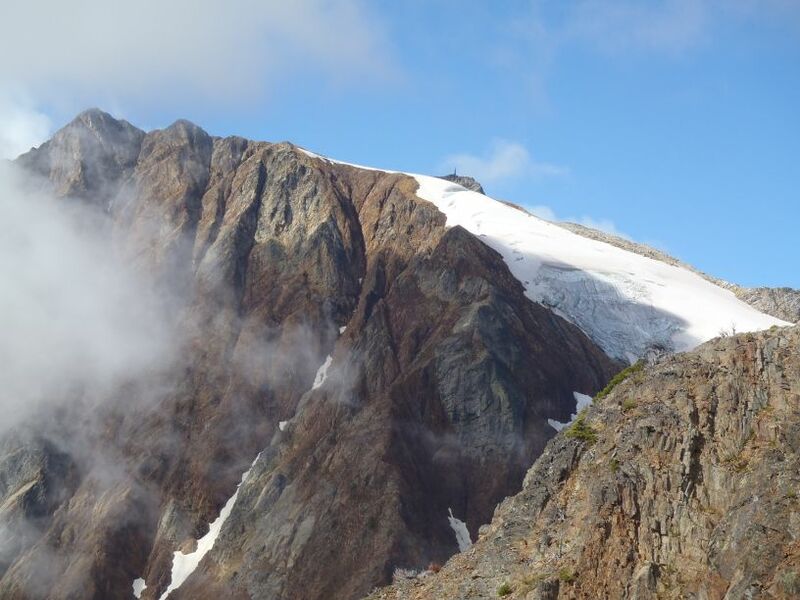 This is not a peak recommended for amateur mountaineers or hikers. Several route variations are available which could include rock climbing, glacier travel, and/or other forms of roped mountaineering. Birkenhead Peak's summit is at upper left.